When you arrive for your first visit, you will have your personal identification details, medical history and medication history collected by our staff. At each visit, after checking in with our Reception staff, you will then have your vision checked and pupils dilated at every visit by our Orthoptic staff. This will blur your vision for up to 4 hours and you should not drive during this period. You will then be cared for by your retinal specialist. 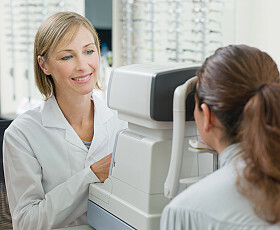 If an emergency arises and you present on a day when your regular retinal specialist is not available, you can have the confidence that all of our doctors are fully fellowship trained retinal specialists and will provide you with the best possible care. If you have an urgent surgical problem, such as a retinal detachment, you may then be admitted into Sydney Eye Hospital, Macquarie University Hospital or Dalcross Private Hospital for surgery by one of our Vitreoretinal Surgeons.